Designing, implementing, and maintaining a dependable backup and recovery plan is a crucial administrative task for your Laserfiche system. Before an administrator can think about how to back up Laserfiche data, s/he must have a firm understanding of what needs to be backed up and why. A leading cause of administrators failing to create reliable Laserfiche backups is not knowing, or forgetting, to back up a crucial component. Installing and running the Repository Backup Summary Generator utility will help you quickly generate an HTML summary of the core Laserfiche repository components that you need to back up, and where each one is stored. 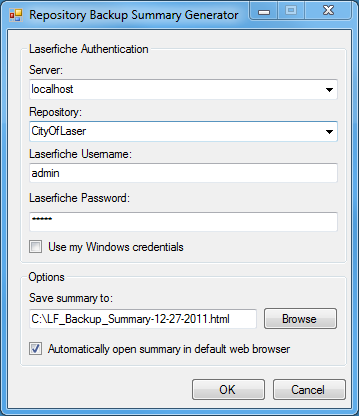 The City of Laser’s Laserfiche installation was recently taken over by a new IT administrator who does not know where all the repository’s components are located (e.g., repository database, directory, search catalog, etc.). To design a comprehensive backup plan, the administrator can utilize the Repository Backup Summary Generator. Once the Administrator has logged in and clicked “OK”, a report similar to the one below will open in his default web browser. What are the limitations of this utility? The utility does not list components for other Laserfiche products such as Workflow, Quick Fields, or Agenda Manager, which may also contain data that should be backed up. Information about backing up your Laserfiche Server, as well as these and other Laserfiche products can be found in Designing a Laserfiche Backup and Recovery Plan. Volumes must contain at least one file in order to be included in the summary. What else do I need to know about this utility? You do not need the Laserfiche Client installed to run it. It is compatible with Laserfiche Server 8.0 and above (including Laserfiche 8.3). It should be run from an “all-access” administrator account that has all possible rights and privileges. Open the “Install” folder and run the “Setup.exe” file. Follow the prompts. The utility’s source code can be found in the “Repository Backup Summary Generator.sln” file inside the “Source” folder.This project was written in VB.NET using Visual Studio 2008.